Through months of ongoing, extensive lobbying work, NAR has reached an agreement on H.R. 2874 “The 21st Century Flood Reform Act,” the legislation in Congress that could reauthorize the NFIP for five years. House Financial Services Chairman Jeb Hensarling agreed to changes in H.R. 2874 to which NAR had been objecting. As a result of these changes, H.R. 2874 will now contain no changes to current grandfathering rules and will also address NAR concerns over NFIP affordability. NAR staff and the Leadership of the NAR Insurance Committee are confident that the final version of H.R. 2874 will address the goals of all six of NAR’s Flood Insurance Principles. A House vote on this NFIP bill (H.R. 2874) could occur as early as the week of July 24th. The U.S. Senate Banking Committee is expected to markup its own flood legislation before it leaves for its August recess. NAR is hopeful that this movement on NFIP Reauthorization by both chambers will lead to a long-term reauthorization bill before the September 30th expiration deadline. More updates will be provided as developments on the Hill warrant. Why is the federal government in the flood insurance business? Each year the federal government spends billions of dollars on disaster relief to flood victims – all at taxpayer expense. Floods claim more lives and property than any other natural disaster. Flood disasters have been declared in every state in the past 5 years alone. Floods are not only coastal issues; they occur nearly anywhere, anytime. Flood zones exist along rivers, lakes, creeks, as well as the coasts. If more properties were insured for flood damage, fewer owners would turn to taxpayers for disaster relief after the next major flood. The problem is misinformation keeps the private market from meeting the demand for flood insurance. ‘It’s a lemon’ – just one flood can bankrupt insurance companies so they will set rates high to cover their losses. However, few property owners will see flood insurance as worth buying since they believe they’re being over-charged. ‘Never flooded’ – Even where there is a 2% annual flood risk (very high), a property still has a 50/50 chance of not flooding over 35 years. It is human nature not to believe a risk until there is a flood – no matter how accurate and reliable the risk communication. ‘Costs too much.’ Because only the “high-risk” properties will tend to buy (i.e. “adverse selection”), it will distort the market and drive up rates until no one – not even those who flood repeatedly – can afford the flood insurance. 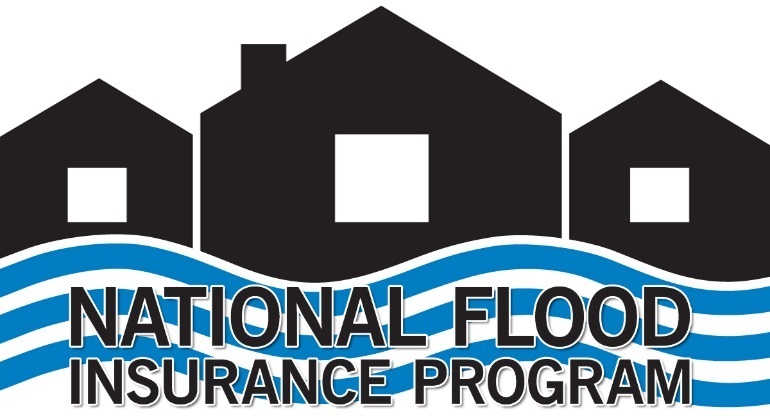 The National Flood Insurance Program (NFIP) provides an insurance market alternative to taxpayer-funded disaster relief. Reauthorized to issue flood insurance every 5 years or the program terminates. Purchased through private insurance companies but administered by the Federal Emergency Management Agency (FEMA) which sets rates and coverage terms. Reduces the information barrier by mapping the flood risk and rating communities. Requires flood insurance for a federally backed mortgage where there is a 1-in-4 chance of flooding over 30 years (i.e., a 1% annual risk). Prevents cherry picking in communities that participate in the NFIP. Averts billions of dollars in property damage each year because communities must adopt and enforce flood building codes and standards as a condition for joining NFIP. Why is the NFIP nearly $30 billion in debt to the Treasury? Historically, the NFIP has been self-sufficient, bringing in more premiums than it paid out for most of its history. Then Hurricane Katrina struck in 2005, and the program had to borrow from taxpayers in order to cover several catastrophic loss years in a row. However, this loan must be fully repaid plus interest to compensate taxpayers – which costs less than disaster relief grants and loan subsidies which will never be repaid. Recent reforms to NFIP will put the program back on the path to self-sufficiency according to the Congressional Budget Office. Taxpayers are still “on the hook” for the $30 billion if NFIP ends, but a terminated program won’t be able to generate new premiums to help reduce the loan balance. Are some states cross subsidizing others? There is no evidence that any state in the union is paying more so others can pay less for flood insurance, according to the Congressional Budget Office. Comparing average statewide premiums is misleading; see this example of a coastal state that is paying a higher rate but its statewide average is still less than an inland state’s. It is true that some older property owners are paying less than full cost and NFIP borrowed from taxpayers to make up the difference. However, no property owner is paying more than the full cost for NFIP to insure their property. In fact, the subsidies for older properties are phasing out by law and taxpayers are being compensated for the Treasury loan with interest in the meantime. Are some states paying more in premiums than they get back in claims? …But historic data won’t predict record-breaking events like the Midwest floods in 2011. Just ask the Gulf Coast before Hurricane Katrina or New England before Sandy. One must also consider a state’s current “exposure” (i.e., how many properties could pay-out at any given time); not just how much has historically been “paid in” versus “paid out” over some select number of years. According to CoreLogic, $490 billion of Florida’s properties are exposed to storm surge, constituting one-third of the national total, and 40% are at “extreme risk.” It wouldn’t take a very large hurricane before Florida was no longer deemed a “donor” state. In fact, the most damaging storm in U.S. history was the 1926 Great Miami Storm which, had it happened in 2005, would has cost $140-$160 billion – dwarfing Katrina’s $80-billion price tag. If it happened once, it could again. Just because a state has dodged the flood “bullet” for 40 years doesn’t mean its luck won’t run out tomorrow. What about recent reports of an emerging private flood insurance market? There are now several private flood insurance companies that will write first-dollar coverage in higher risk flood zones. Private companies will underwrite the risk property-by-property whereas NFIP maps at the community level and may inadvertently include lower risks. Private companies will charge rates that better align to the individual property risk, while NFIP charges national average rates that are too high for some and too low for others. Private companies will charge a premium that includes a normal rate of return and accounts for costs like taxes and reserves which NFIP doesn’t pay. Private companies won’t be able to insure all 5 million NFIP properties so they will be more selective and may raise rates or drop coverage after floods. Also NFIP considers this a “coverage lapse” so properties won’t be eligible for a lower rate if they leave the program and a private market policy doesn’t work out. 2014 “Grimm-Waters” Act amends Biggert Waters and applies the gradual phase-out of subsidies to all older properties. 2013 Superstorm Sandy strikes New England; NFIP borrowing now totals $24 Billion. 2012 “Biggert Waters” Act reauthorizes NFIP through 2017 and will gradually phase-out subsidies for older properties except at the time of sale. 2008-12 NFIP extended 18 times and twice allowed to shutdown stalling 40,000 home sales a month. 2005 Hurricane Katrina strikes the Gulf Coast becoming costliest hurricane in U.S. history; NFIP borrows $17 billion from taxpayers to cover claims from the 2005 storm season. 2004 “Bunning-Bereuter” Act reauthorizes NFIP through 2008 and attempts to phase-out subsidies to the 1% of properties with “severe repetitive losses” accounting for disproportionate share of NFIP claims; however, loopholes prevent full implementation of this pilot project. 1994 NFIP amended to strengthen lender enforcement of the mandatory purchase requirement. 1983 NFIP supplemented through Write-Your-Own program which allows NFIP to continue setting rates and coverage terms but contract with private insurance companies to service individual policies on FEMA’s behalf. 1973 NFIP amended to require flood insurance for a mortgage in the mandatory purchase zones. 1968 NFIP created as insurance alternative to rising cost of fully taxpayer-funded disaster relief. 1965 Hurricane Betsy strikes Gulf Coast becoming first in U.S. history to cost a billion dollars. 1956 Federal Flood Insurance Act authorizes program which isn’t funded; the American Insurance Association finds that flood insurance is not commercially feasible. 1950 Disaster Relief Act creates the first permanent system for post-disaster aid. 1930-50 Government funds a series of flood-control projects and flood-specific disaster loans. 1929 Private insurance industry abandons coverage of flood losses. of the Cincinnati Area Board of REALTORS®.